I promised more details later, and I guess it's now later, so here we go, run-on sentences and all. First, attached (down below) is a pic of a nasty bug that was on my windshield as I started off for Upward Basketball this evening. 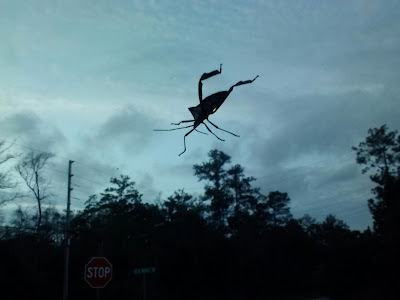 It wasn't on there for long, once I started getting speed up to where it could no longer hold to the windshield, poor bug. I didn't go back to look for it though. So, I guess you're wondering why I say Alabama cheats, huh? Well, I'll tell you. It has to do with a speeding ticket. No, not my ticket, and not one of my kids' tickets, but I won't tell you whose it was (even though I was in the act of paying it). So, in Alabama you essentially have two choices for paying a ticket: go to court, and pay the court cost on top of your ticket fine, or pay it online, with a "convenience fee" tacked on. There's no way to pay just the fine. To me, that's cheating, tacking on extra money beyond the fine, that there's no way around. And so, Alabama cheats, increasing revenue of fines without the legislation to increase said fines, and without increasing the fines themselves. Cheating. And we're all going to need discounts, what with our "no tax increase on the middle class" going on. As with most people, my paycheck was cut this first paycheck of 2013. Social security tax went up by 2%, which equates to 47% more SS tax per paycheck. The irony is that SS tax is only calculated on the first $113,700 of your paycheck. That is, those who make well north of middle class will only be additionally taxed as much as those who make the aforementioned 113k. Proportionately, the percentage will actually be lower, since the additional tax dollar amount is a much lower percentage of the overall pay. Anyway, enough about that for now (ask if you want more info or specific examples). Unrelatedly, I'm typing this blog out on my new to me phone, an LG Lucid, with no physical keyboard (while watching "Sherlock" on Netflix). Hopefully I've caught and corrected all the typos in this post. If not feel free to berate me. I'm a big boy (but dieting! ), so I can take it. I think.